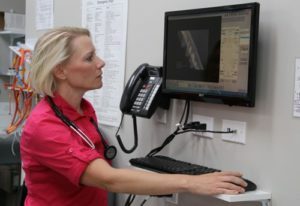 When we need to look beneath the skin to determine the severity of an injury or illness, Central Animal Hospital uses the latest digital imaging techniques to make a more accurate diagnosis. Our radiology department is equipped with digital radiography and ultrasound to help us diagnose and determine the severity of your pet’s injury or illness in a non-invasive way. Having digital radiology on site allows us to quickly view radiographs, and if needed, send them to a certified radiologist for a consultation with the click of a button. Because we’re able to diagnose more quickly and accurately, we can develop the most effective treatment plan. Both Dr. Keith and Dr. Smith have additional training in ultrasound to utilize this tool to quickly identify life-threatening conditions, as well as perform emergency procedures such as thoracocentesis and pericardiocentesis. We also have Dr. Rae who is an extremely skilled ultrasonographer available on a referral basis for detailed abdominal ultrasound, echocardiograms and ultrasound guided biopsies.